This article is about Laser Drill. You may be looking for Laser, Mining Laser or Laser Focus. 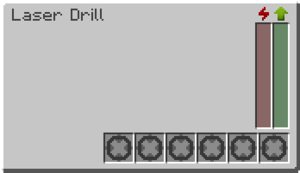 The Laser Drill is a block added by the MineFactory Reloaded mod. It allows the player to harvest ores from bedrock, although technically, rather than actually mining ore, it generates a random ore (even Nether Ore)  to an inventory placed on top of the Drill. To function the Drill needs a clear line of sight to bedrock, so a shaft free of obstructions has to be manually dug down by the player (Torches will be removed by the beam), or by using a Mining Well. To set up, align the Drill above this shaft and energise it using up to 4 Laser Drill Precharger , a rotating power beam to the Precharger and down to the bedrock will appear when ready  or solid block. If the setup is correct, the drill will start generating ore, a process that takes a minute (with one Precharger). To remove the Drill Shift+Right-click using a Crescent Hammer. The GUI is simple and shows the energy buffer and work progress. There is an inventory to add up to 6 Ore specific Laser Foci. The Drill has an internal energy buffer of 1,000,000 RF and consumes 6,000,000 RF per Ore generated. The Precharger supplies 5,000 RF per tick  (when supplied with suficient energy), for a total of 20,000 RF/t, if 4 Prechargers are used. The energy transfer may be interrupted using a Redstone signal on the Precharger to pause the Laser Drill; energy transfer will restart after 200 ticks (10 sec) once the signal is turned off. Using a single Precharger it will take 1,200 ticks (60 sec) to generate an Ore.
Laser Drill has no known uses in crafting. ↑ The generation rate varies depending on the type of Ore and draws from all mods installed. ↑ Place with a one block space from the drill with the output aligned to the drill. Rotate by Right-clicking using a Crescent Hammer. ↑ Hardened Glass can be substituted with the following items: Fused Quartz, Hardened Lumium Glass. Diamond can be substituted with Industrial Diamond. ↑ With GregTech, the recipe may differ depending on the difficulty level. ↑ With Agrarian Skies modpack, the Precharger rate of transfer is 2,500 RF/t. Using The Laser Drill can generate ores impossible to obtain by mining. This is because when different mods add two ores of the same type, FTB usually only allows one type to generate in the world. Via a mining drill, the player can obtain all the types. Iridium Ore can be generated via a Laser Drill. Although the ore is in a block form and cannot be used to create electrical armor or tools, it can be ground and smelted to produce Iridium Ingots, which may be used in the making of Advanced Solar Panels. This page was last modified on 26 February 2018, at 07:07.